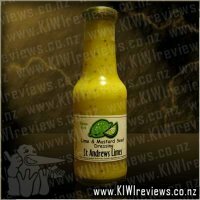 Now of course we&apos;ve added our Proper touch, using Apple Cider Vinegar and New Zealand&apos;s finest Lake Grassmere Marlborough Sea salt. Wholegrain Corn, High Oleic Sunflower Oil, Sea Salt, Apple Cider Vinegar, Vinegar, Acacia Gum, Citric Acid, Raw Sugar. That&apos;s all! 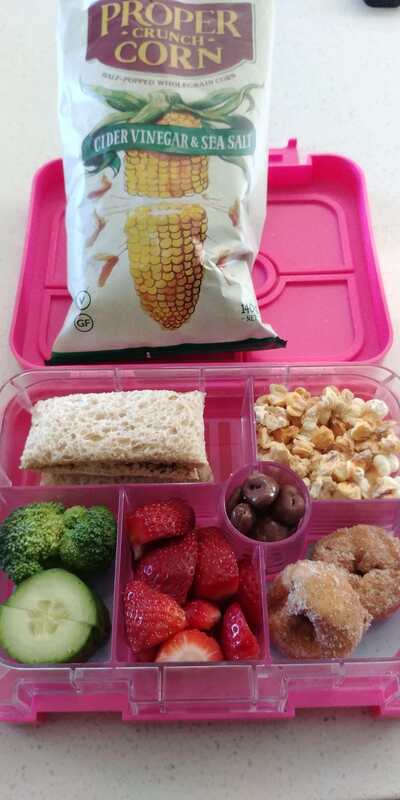 When it comes to a healthy snack food, the benefits of popcorn seem to be becoming better known. 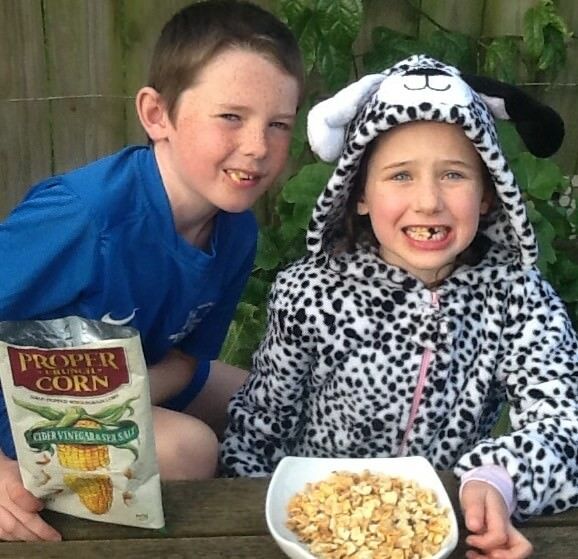 We often enjoy it as a great family option for a snack which pleases everyone. However, most of the options available are either incredibly sweet, or rather boring. I was so excited to see this new creation from Proper, and in particular the Cider Vinegar & Sea Salt flavour. This has to be one of our favourite chip flavours, and we were really excited to see how it converted to a popcorn flavouring. 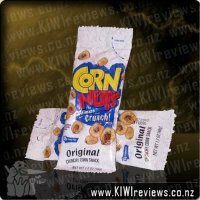 We were also excited to know that this had been created by the team that created Proper Crisps, which have to be some of the best crisps in New Zealand. Needless to say, were very excited to receive our pack to review! As usual with anything Proper produces, the the packet is great quality, beautifully designed and a generous size. It is instantly obvious what you are buying, and the pack was reassuringly heavy and full (unlike so many other brands available). When we opened the pack we were a little surprised with what we found. The corn wasn� ™t like anything we had experienced before- and the description of �half-popped� ™ is certainly accurate. It looked smaller than we expected, but was very generously coated with seasoning. The taste was fantastic- the kick of cider vinegar was strong (just how I like it) with a great hit of sea salt guarenteed to keep you coming back for more. The crunch was incredible, but it didn� ™t taste like the unpopped kernels you sometimes you get at the bottom of the bag. 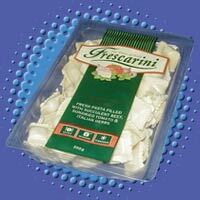 These were crunchy in a lightly popped way, with no risk of shattering your teeth whilst eating them. These were a great snack which our whole family enjoyed. What is more, with the quantity contained within the sharing-sized bag, there were plenty of helpings, and more than enough to go around on multiple occasions. 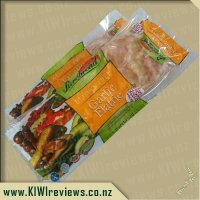 For the quality and the product itself, I definitely felt like the pack was great value for money, and something I could just as easily use as a snack for everyday as something a bit different to serve as nibbles with drinks. Overall, Proper have once again come up with a fantastic product. Great quality, unique and really tasty, this corn is a snack for the whole family for a wide variety of uses. The pack represents great value, and is certainly something we will be buying again. As ever Proper, I cannot wait to see what you will do next! I am a fan of popcorn as a snack because it is one of the healthier options out there that still feel like a bit of a treat. Flavoured popcorn is even more special as when we were children it wasn&apos;t something you really got (unless you got caramel or the rainbow candy corn as a treat). Reading the information for this product I was very intrigued as to how half popped popcorn worked - how can you pop a corn kernel only half way? And what would it be like? 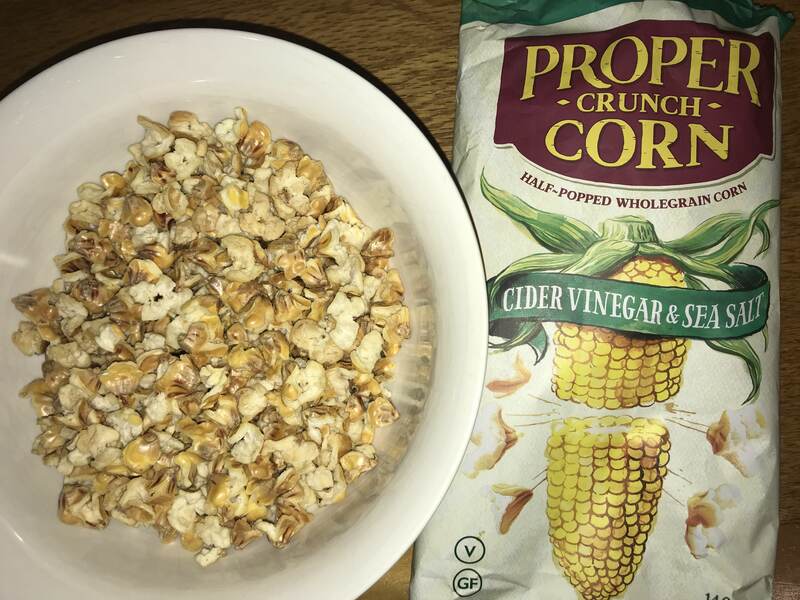 I was excited to receive a bag of this cider vinegar and sea salt popcorn to try. The package is very attractive, and fits with the rest of the products in the Proper Crisps range. Seeing a package like this on the shelf I will automatically know who it is from as they have built great branding and are consistent in their use of it. Opening the packet I could smell the cider vinegar - yum! The popcorn itself was very interesting looking. I&apos;m still at a loss as to just how you manage to half pop a corn kernel, and do it consistently enough to fill a whole bag! Trying one I was surprised at just how crunch each kernel was. It felt more like I was eating a rice cake, but without the rice cake flavour I hate. It was certainly more chip like than popcorn like in texture, it was so good! 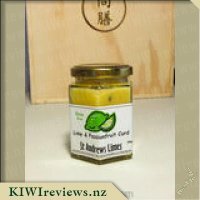 The flavouring on this particular product is perfect in my opinion with just the right amount of vinegar to salt. Later that week my partner came over and we were cooking dinner together for my Dad. Having some of the popcorn still left in my pantry I poured some into a bowl, making to leave a handful worth in the bag as I do like to taste a product as I write about it to make sure I don&apos;t miss anything! Let&apos;s just say that the bag didn&apos;t last long, and it certainly wasn&apos;t me or my Dad eating it. My Dad tried it and said it was nice, but he isn&apos;t a big fan of popcorn so a little bit was enough for him. 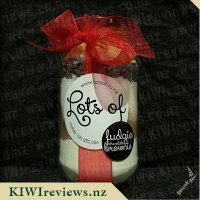 Obviously my partner really enjoyed it, commenting that the flavour was yummy and that he enjoyed the texture of the product. Luckily I did put a handful back into the cupboard as it wasn&apos;t long before the bowl was empty! This would make a great snack for work (I work in a nut free centre and finding healthy snacks that are nut free can be hard) or would equally be great at a party or get together with friends. I will certainly be looking for it in my supermarket and adding it to my trolley. My partner and I were excited to try these proper crunch corn crisps. I loved the bag and thought the green looked awesome and something different. I loved the corn cob on the front of the bag. We opened the bag and tried a few, straight away my partner was saying how amazing they were and he was going back for more. Me on the other hand did not like the flavour that much and was not very keen on them. 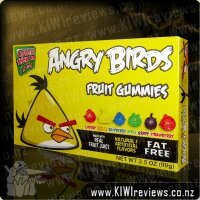 I thought the flavour was weird and they were to crunchy for me. However my partner ate the whole lot apart from sharing some with my son who liked them as well but he was only keen to have a couple mouth fulls. My partner asked if we can start buying these in the supermarket from now on and went on and on about how good they were. My son thought they were to hard, and got stuck in his teeth. He has a lot of gaps in between his teeth so he said it was annoying as he had to sit there and get them all out of the gaps. He said he was not keen on that part and says he prefers soft pop corn. I personally was not a fan of them, but I guess that is just my opinion as I mentioned above my partner loved them. So they are each to their own and something you need to try yourself to see if they are your thing or not. I will however buy them again for my partner seem as he loves them so much. And I will be telling friends to have a try to make their own decision on them after our household had mixed reviews. Popcorn has always been a party and sleepover staple, we used to be restricted to butter and salt but this simple snack has done a whole lot of evolving and adding to its repertoire. When I went to Arizona I was then introduced to corn nuts (corn kernels that are air dried before being prepped, so no popping) and it had several different seasonings. These new Proper Crisps snack gives us the middle ground, half popped corn kernels (it does make me quite curious about the cooking process). I love that these are vegan, it means I can grab a bag when the vegans come to visit and to top it off, there&apos;s very few people, I reckon, that couldn&apos;t eat these. Opening it up I could smell the vinegar, not overpowering, just strong enough that it had me wanting to reach in and grab a handful. I gave my mum a handful, she&apos;s not a big vinegar fan but happy to try it, especially with the added fact that she&apos;s never had half popped popcorn. She loved the crunchy texture but found the vinegar was too strong. Two of my three kids love salt and vinegar chips, so eagerly held out their hands for some. They both pulled a face initially with the hit the cider vinegar gave but declared they loved it and finished almost the whole bag between them. I found that I couldn&apos;t eat too many in one sitting, they were quite tart, but it was a nice flavour. I loved that I didn&apos;t get anywhere near as much bits stuck between my teeth or jabbing up into my gums, so a big plus. These were a hit with the majority of the house, so I can see this being bought again. Proper Crunch Corn really drew my attention. From the picture it looks like a packet of chips like their other products but since there is a picture of a corn on the front it implies that it&apos;s definitely not like their other products. I was seriously intrigued and I can only put that down to the Proper Crunch Marketing team who have done a fantastic job. I can honestly say I have never tried anything like this product before. It&apos;s basically popcorn that has only been half popped and is very crunchy which would put it kind of like a mix between chips and popcorn. The packet size was similar to other chip or popcorn type snacks and was perfect for my family to eat while watching a movie. My kids tried it but they have obviously inherited my sweet tooth and wanted some "Proper popcorn with icing sugar and butter", which left the rest of the packet to my husband and I. We both enjoyed it for what it was, a small snack to mindlessly eat while watching a movie but I can&apos;t say it was something spectacular, it just left me wanting something a little different and I&apos;m not sure if that was the flavour or the half popped corn. I&apos;m not sure if I&apos;d ever buy this particular packet again. The flavour, Cider Vinegar & Sea Salt, made me think of chips and I prefer the texture of chips over this half popped corn. However, I would love them to add a sweet selection to this half popped corn, I think caramel would match with it perfectly and my kids would be much keener to try a sweet version. 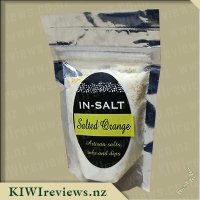 I detest salt and vinegar chips - nearly all brands have far too much vinegar for my liking; I prefer the taste of plain salt or one of the less intense flavours like chicken or barbecue. So I was prepared to let the family evaluate this for me and trust their judgement. However, my daughter took one mouthful and her face was instantly transformed. She insisted that I try one before I let my prejudice stop me, so I did. And wow! I could see what she meant. This was nothing like the salt and vinegar crisps I had tasted in the past. 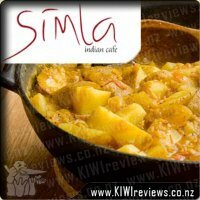 This was a whole new taste sensation, and I loved it! After we had both eaten several handfuls (to make sure we could make an honest judgement) we came up for breath and discussed why it tasted so good and was so different from any other similar vinegar-based product we had eaten. 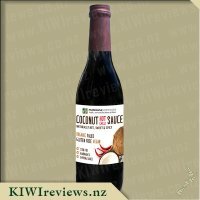 She had not seen the packet so was not aware that the flavour was actually cider based, not malt or white, so said she thought it was something about the vinegar flavouring. It was milder - she described it as "warmer" and "full-bodied but not harsh" which I thought was a really good way of putting it. Only then did I show her the packet and she realised why it was so different. Next, we tried it on my son-in-law and the children. All of them were instant fans. Mr Eight and Miss Six were so taken by it that they had an impromptu discussion about how much they liked it, and allowed me to film them! Mr Eight could not stop telling us how much he loved the crunch and the combination of flavours; Miss Six, too, liked the crunchy texture. This is a product we will certainly buy again, not only as a healthy snack, but also as an addition to meals like salads or egg dishes in place of other carbohydrates like hot chips. Both my daughter and I will be looking out for it next time we visit a supermarket. Popcorn is a pretty popular choice of snack in our house, one which is relatively healthy and cheap. 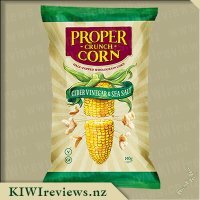 When I was a kid I remember going to the Fieldays where I was able to purchase a yummy salt and vinegar flavour popcorn which I was never able to get anywhere else throughout the year, so when I saw that this was up for review I was excited at the chance to try it as I knew that there was the chance that it would taste just how I remembered it to be. The packaging was attractive and I love how it has a real natural look about it, just like the contents, the Proper company states it&apos;s "entire range is all 100% Natural real food", this is great as it means it is so much better for you and that it is suitable for those who are gluten free, dairy free and also Vegan as it contains to GMO, MSG or trans fat. The packaging also shows a little diagram of the stages of corn, going from un-popped, to half-popped and then to fully popped. This particular corn is half-popped which is another thing which sets the company apart from others. 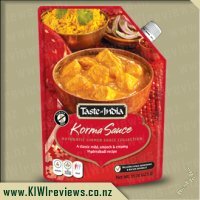 Tastewise this stuff was amazing everyone in my family loved, even Miss 5 which took me by surprise due to the strong vinegar flavour, however, she commented that she loved the "salty taste" and has even asked to have it included in her lunchbox this week. My partner isn&apos;t a fan of salt and vinegar flavouring so he chose not to try it, however, I can say that it got the thumbs up from me as I loved it, it was a lot different to the salt and vinegar popcorn I ate as a child but I put this down to the fact that it is made from cider vinegar rather than perhaps white or malt vinegar which therefore changes the flavour entirely. Last night at dinner we had a meal which consisted of sausages, chips, and salad, I would usually put a vinegarette dressing of some sort over my salad but instead I decided to pop on some of the half-popped corn to add some flavour, not only did the flavour of the corn add the perfect taste but it also added a lovely crunch and texture to the salad which was made up of lettuce, cucumber, strawberries and Camembert cheese and it is something I&apos;d most definitely add to my salads in the future. 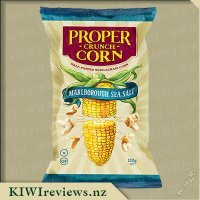 Another amazing product from the Proper company which I will absolutely be buying more of in the future, I look forward to seeing if the range of Proper Crunch Corn expands with more flavour options.